The kitchen already had great bones, it just needed a few updates. This area was a great example of a room that got a completely new look just by making a few high-impact changes. The first item on our to-do list was to remove the wallpaper and carry our main wall color, London Fog, throughout the kitchen. We added in a beautiful white ceramic 3×6 subway tile in a brick set pattern as the backsplash and carried it up all the way around the kitchen sink window. We also decided to change out the traditional hardware with a more modern polished copper hardware. This is such a simple change but it makes a huge impact on the overall look of the room, adding instant warmth with a cool edge. We kept the lines simple and clean with our table. To complement it, we chose a sleek mid century style chair with a black finish. The basket chandelier adds in a relaxed feel to this space and brings in some gorgeous texture. We pulled in one of our favorite pieces, a copper mirror, and placed it on the half wall behind the table to bounce light around the room and expand the space to make it feel larger. The copper mirror echoes the copper hardware in the main part of the kitchen and adds an old-world charm to this room. 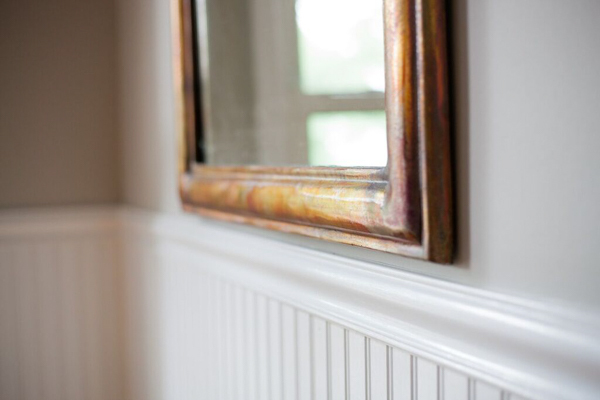 The patina on this mirror frame is just gorgeous! 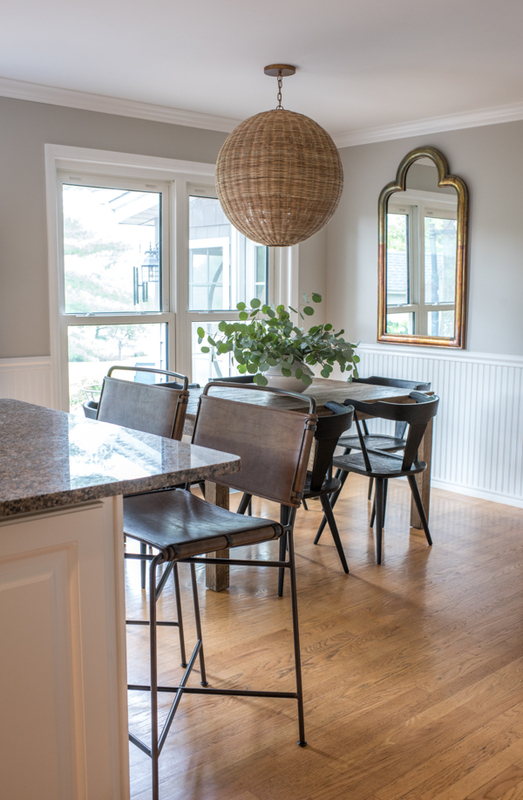 The simple Parsons table is perfectly suited to this eat-in kitchen. It’s subtle and understated, but the beautiful reclaimed wood mixed with the black finish on the chairs adds in so much character. These leather and steel counter stools are both beautiful and practical. The leather makes it easy to wipe up spills and messes, yet adds so much warmth to the space. Shop Lucky 33 Kitchen Products here!